I am a research associate within the Hamlyn Centre for Robotic Surgery, Imperial College London. My PhD was accomplished in the Hamlyn Centre where I was advised by Prof. Guang-Zhong Yang. My research interests include surgical vision, robotic surgery, visual servoing, image-guided intervention and machine learning. Y. Gu, Y. Hu, L. Zhang, J. Yang, G.-Z. Yang, "Cross-scene Suture Thread Parsing for Robot Assisted Anastomosis based on Joint Representation Learning" IEEE International Conference on Intelligent Robots and Systems―IROS 2018. M. Grammatikopoulou, L. Zhang, G.-Z. Yang, "Depth Estimation of Optically Transparent Microrobots Using Convolutional and Recurrent Neural Networks" IEEE International Conference on Intelligent Robots and Systems―IROS 2018. P. Pratt , A. Hughes-Hallett, L. Zhang, N. Patel, E. Mayer, A. Darzi, G.-Z. 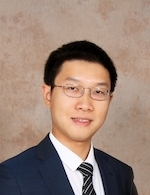 Yang, "Autonomous Ultrasound-Guided Tissue Dissection" International Conference on Medical Image Computing and Computer-Assisted Intervention―MICCAI 2015. L. Zhang, S.-L. Lee, G.-Z. Yang, G. Mylonas, "Semi-autonomous navigation for robot assisted tele-echography using generalized shape models and co-registered RGB-D cameras" IEEE International Conference on Intelligent Robots and Systems―IROS 2014. © 2018 Lin Zhang. All Rights Reserved.